Back in the late 50’s Ford were keen to find out what campers wanted out of a station wagon. The result was this unassuming Country Squire in 1958. To the uninitiated it looks like a normal car with a boat on it, but Ford had been playing with fitting everything a potential camper could want while transporting the whole family day to day. With a push off a button the boat would flip over and hang over the side of the car ready to be lowered into the water for a spot of father son fishing. From under the boat would then spring up a tent that would sleep two. Lower the back and pull out the kitchen complete with electric fridge and running water, and with another push of a button a fold out roof covers the rear. 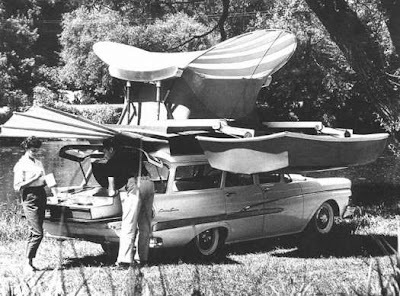 What an awesome concept that can still be seen available today with roof top tents. Surely many changes and improvements in RVs and Camper vans has come along the way. 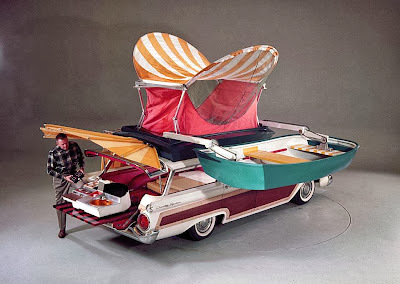 But looking at this old looking ford country squire camper, I think the purpose of campers didn't change a bit. They still help us, as campers and/or travelers, to have a better camping experience. The very reason why, I think buying an rv will definitely be helpful and useful, even if it's already used. - Demi B.